Yesterday, I reviewed a book that felt like a Jane Austen. Today, I’m writing again to my kindred in literary geekery. 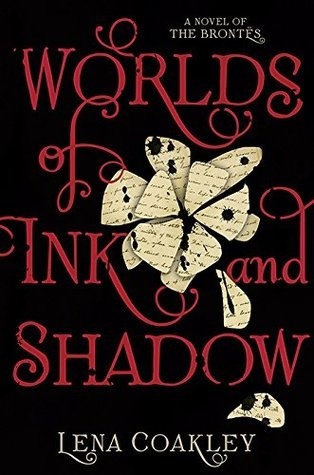 Worlds of Ink and Shadow is a fantasy story starring The Brontë family, and it will have you digging out your copy of Jane Eyre (either that old paperback or the delicious movie adaptation starring Michael Fassbender). It’s a slow burn, but those who stick it out will feel it was worth it. I struggled with this book for quite some time before I was finally able to settle in and enjoy the story. The elevated language, which is necessary to evoke these characters and this time and place, won’t make for an easy read for most YA’s (or adults). The large cast of characters, though individually distinct, will probably be a roadblock for some. My biggest struggle was trying to figure out why the author chose the Bronte family because for a good portion of the book that was not clear. Finally, there is a lot of time spent developing several worlds and characters before a clear direction is established. For readers who stick it out until the end, I think there is some real pleasure to be had, particularly for those who have read Bronte books and can see the connections. I teach Jane Eyre, and by the end of the book, I was delighted to see how this author dovetailed her story into the classic. I had a passing knowledge of the Bronte family, but this book made me go hunting for more. As a literary geek, I am wholly delighted by this book, and I’ve already been blurbing it to my students since this fall when we read Jane Eyre. As a realist, I think this might be a difficult book for just any reader to fall into, but those who do, enjoy the ride! Language and situations are appropriate for high school and beyond.